Even in retirement, Brian Urlacher rookie cards and autographed memorabilia command solid values. Now in the Pro Football Hall of Fame, his hobby status should maintain consistent values for years to come. 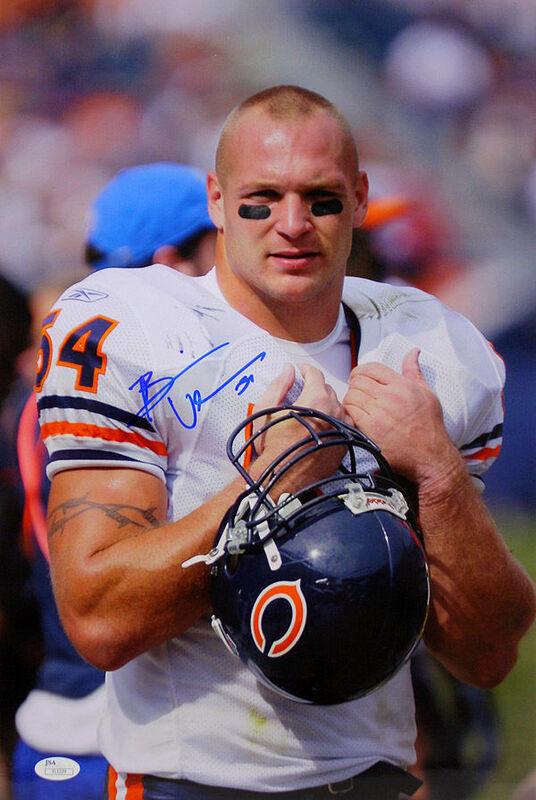 Brian Urlacher is one of the greatest defensive players in the storied history of the Chicago Bears. Although defensive players do not normally carry the same hobby value or popularity as their offensive counterparts, he was one of the most popular NFL players during his prime. Shop for Brian Urlacher cards on eBay. 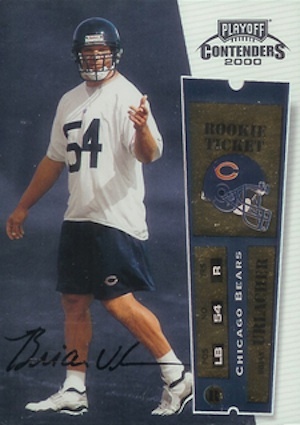 Urlacher has nearly 50 rookie cards from 2000 sets that fall across all budgets. 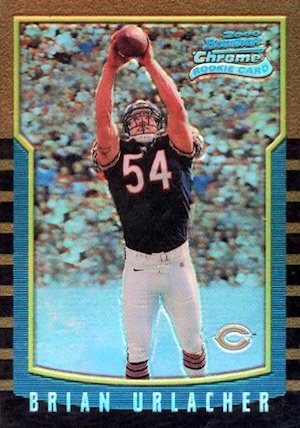 The two autographed Brian Urlacher rookie cards are the clear favorites, but many low-numbered rookies are also popular. Some of the key Brian Urlacher rookies are covered below and the full RC checklist can be viewed by using the tab above. The cornerstone of any Brian Urlacher rookie collection is his 2000 Playoff Contenders Rookie Ticket autograph. This card features a hard-signed autograph and a training camp photo along with the ticket motif common to the brand. While the print run is unknown, the demand is very strong. 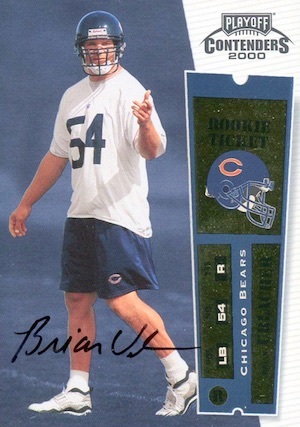 This is an intriguing Brian Urlacher card from Upper Deck. Although not as popular as the Contenders card, the die-cut relic in the SPx logo makes it stand out and the on-card signature is a huge bonus. Still, the placement of the "X" is a little awkward from a design perspective. The 2000 SPx card is serial numbered to 2,000 copies, meaning there is decent supply. This also keeps prices more reasonable. 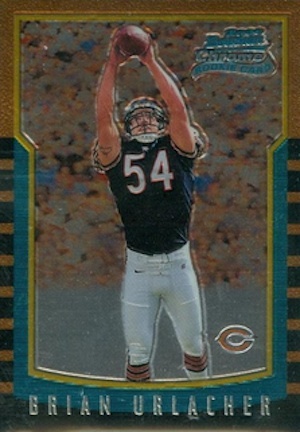 Even without a signature, the 2000 SP Authentic rookie for Urlacher is notable and one of his top-selling cards. A print run of 1,250 copies helps value a lot, as does the classic UD look. 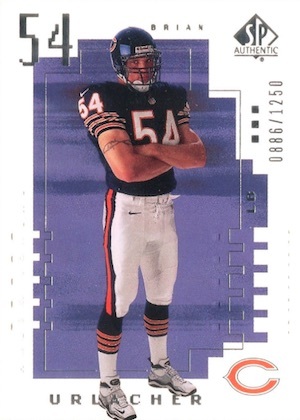 They can actually be a little tricky to locate at times but this is arguably the best-looking Brian Urlacher rookie card available. He also has a Sign of the Times autograph in the set. When it comes to rookie cards, Bowman Chrome has long been a favorite amongst collectors. 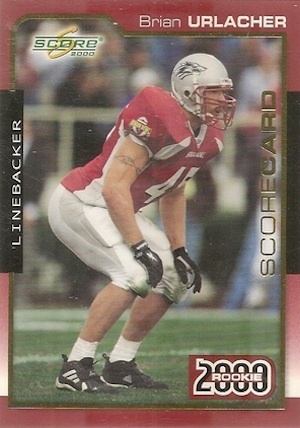 Despite not having an autograph or memorabilia piece, the 2000 Bowman Chrome card is one of the main Urlacher rookies submitted for grading. Naturally, the Refractor versions are the most popular and valuable. His Topps Chrome rookie (#/1,650) receives even more attention but the rarity makes for limited availability. 2000 Sage Hit Brian Urlacher Rookie Card RC Auto UNM Chicago Bears HOF!!! 2000 Collectors Edge T3. Brian Urlacher BGS 9 (9.5,9,9,9.5) See Description! 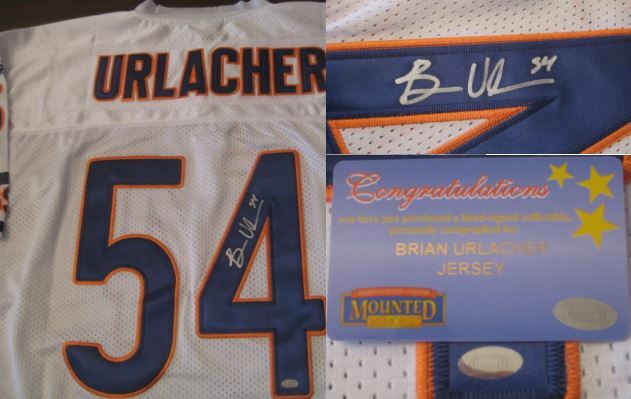 Below you will find examples of what an authentic Brian Urlacher autograph looks like. This can be used as a first point of reference for determining the legitimacy of autograph memorabilia, but is not a substitute for having your items authenticated by a well-respected professional autograph authentication company. Some of the trusted sources within the sports memorabilia market include the following companies: PSA, JSA, Steiner, Leaf, Tristar, Schwartz Sports and Mounted Memories. 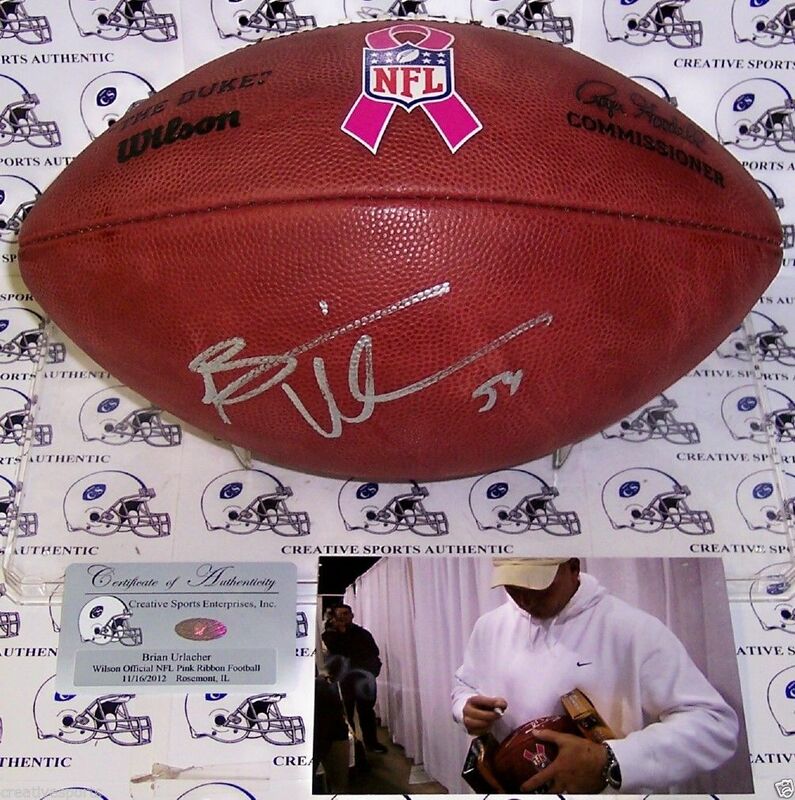 Brian Urlacher Key Signature Attributes: An authentic Brian Urlacher signature autograph will exhibit several distinguishing characteristics. 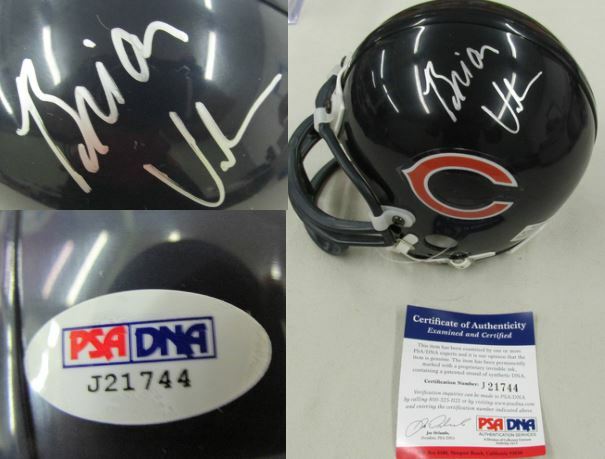 However, Urlacher's signature does vary depending on the type of venue or environment in which he is signing. Most often this is a result of a time factor involved and/or the number of people to sign for. The first name is often simply implied by the letter "B", which typically has at least one tail, usually at the top of the letter. When the first name is spelled out, the letter "n" is implied. The last name consists of two letters, "U-l". The pen lifts between the letter "U" and the letter "l". The letter "l" is usually a vertical line but a small elongated loop is sometimes visible.